For nearly a full day, you and your companions carefully climbed down the broken stairs. Day eventually gave way to a murky twilight as the sun was blotted from the sky by the thick, dark clouds of the Shadow Deep. Most of your party have covered their faces to block out the ash and stink of the place. Finally, the stairway came to an end in front of a boggy pool, dotted with broken ruins and a few trees. The water nearest the stairs is too deep to wade, but it appears to quickly become shallower further on. If you want to carry on with your mission, there is no choice but to swim through the dark waters until you reach solid ground. Still, it is not a decision you take lightly, for who knows what could be living beneath the surface of the dark water? This report is a complete play-through. Pre game notes: At first glance this is probably the most basic of the introductory scenarios. The new thing here will be some environment and swim checks. we are up against swimming Zombies, and potentially some Orcs and some more Flies., I used my Jungle terrain here with some dead or broken trees to get the “swamp vibe” the Swim and Environment checks have the potential to really handicap me if I roll poorly , a nice introduction to adventuring within the Shadow Deep itself. draw one Event Card. This scenario lasts a maximum of ten turns. 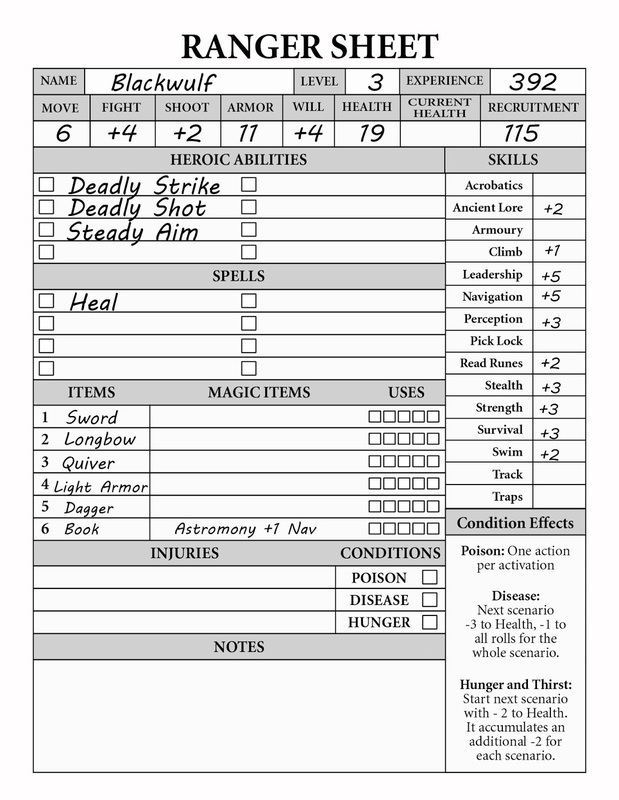 by which it failed the roll, ignoring armor. this turn, but he also takes 2 points of damage from drowning. fighting in deep water receives a -2 Fight. Pretty rough! We will see how we do we have about 8-10 inches to swim based on when we head. Before the scenario begins, each Team member must make either a Will Roll (TN10) or a Survival Roll (TN10) or suffer 2 points of damage from breathing in foul fumes. Thorvald = (2)- 2 = 0 swims 3 inches and starts drowning he takes 3 points of Damage! 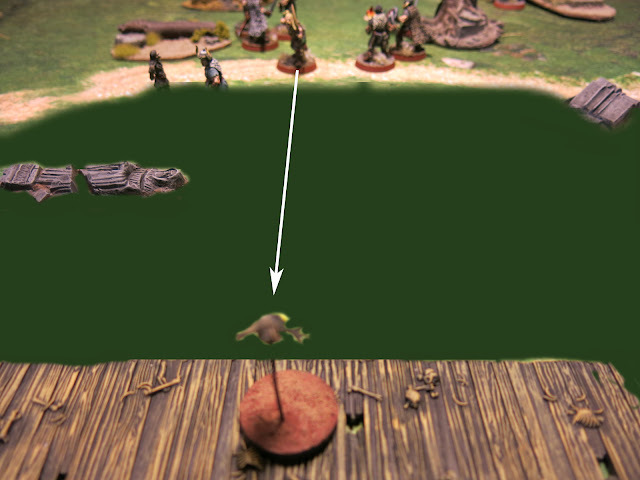 Skuti = (4) -2 =2 he swims 3 inches and starts drowning he takes 1 point of Damage! The all advance with a double move which in a Zombie case is 6 inches. scenario and the next one. 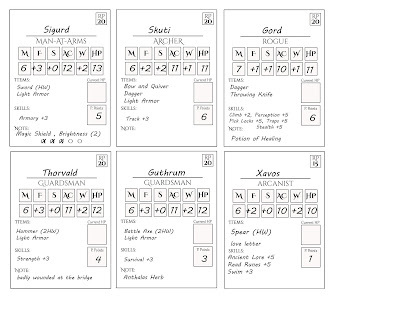 Ooof, going left to right I roll a D8 rerolling on an 8…I roll a 2.. its Ranger Blackwulf.. Swamp Zombie 1 moves toward Blackwulf but had move around some ground terrain and cannot reach. at the centre point of the table edge opposite the stairway. I roll a D3 for my companions still in the water (1) going L to R means Thorvald has a Zombie place in combat with him. 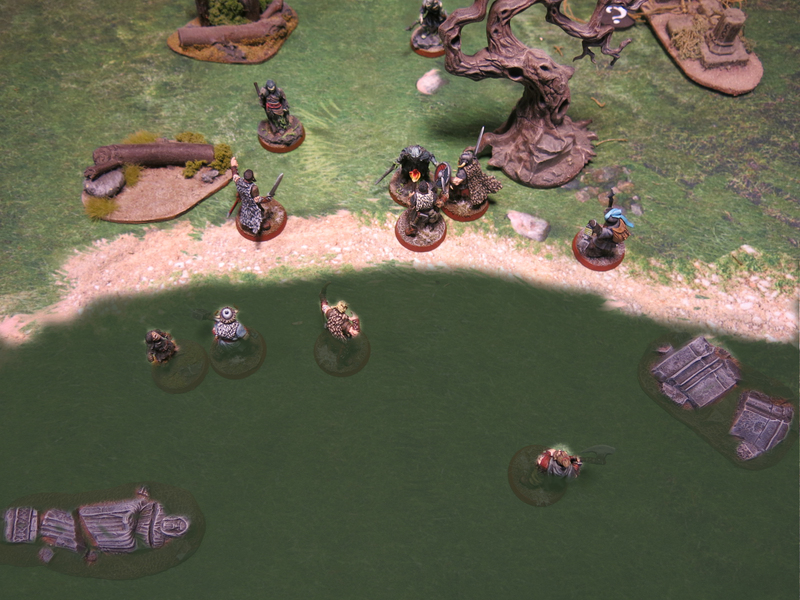 three of them struggling in deep water Thorvald (far left) doest get out of the water until turn 6! Blackwulf attacks Swamp Zombie 1 who was moving in one him. 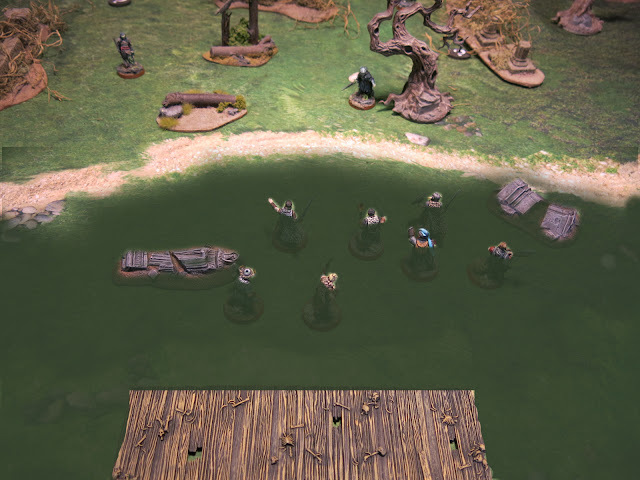 ,(3,4) he wins 7 to 4 but fails to damage the zombie..
Thorvald attacks the Swamp Zombie 4 who rose from the water to attack him. Thorvald is -2 Fight because he’s swimming.. (7,8) with the -2 his +3 = +1 so another tie with no damage. He’s stuck in the water. Skuti makes his swim check at TN 5 (5) but -2 for light armor means he fails…he takes no damage but is still stuck. Swamp Zombie 2 in combat with Gord and Sigurd attacks! (2,9) ugh with Sigurd support the Zombie still manages to beat Gord but crafty rogue escapes damage. He takes 4 damage hes down to 5 health. 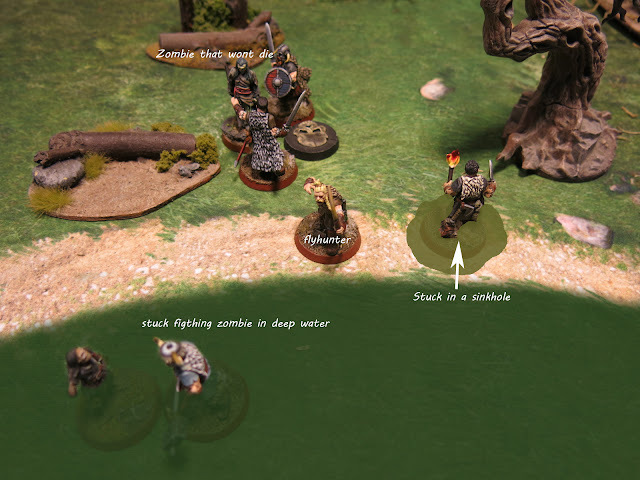 Sigurd with Gords Supporting attacks Swamp Zombie 2 he is +5 (10,5) he wins 15 to 5 but its only 3 damage…these Zombies are hanging in there. 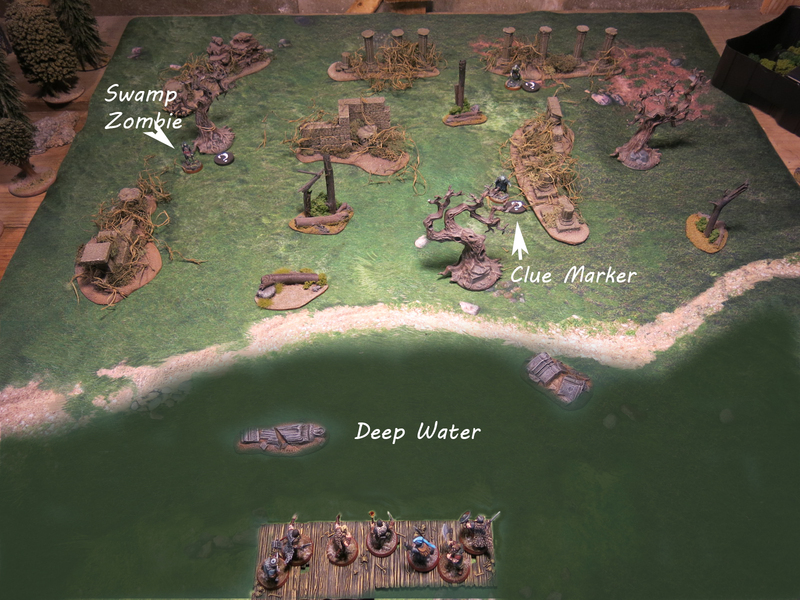 Xavos moves 6 inches into Clue Marker 2…we roll (7) Strange Flowers…great…..
………………….Wow pretty bad turn for the boys overall. Guthrum moves into the combat with Blackwulf attacks Swamp Zombie 3 (15,17) he barely wins he +3 fight making 18 to 17..the +2 damage makes 21 for damage purpose and the Zombie is killed . Turn 4 and the 1st kill of the game..Guthrum then snaps into Blackwulfs fight as support being less than an inch away. 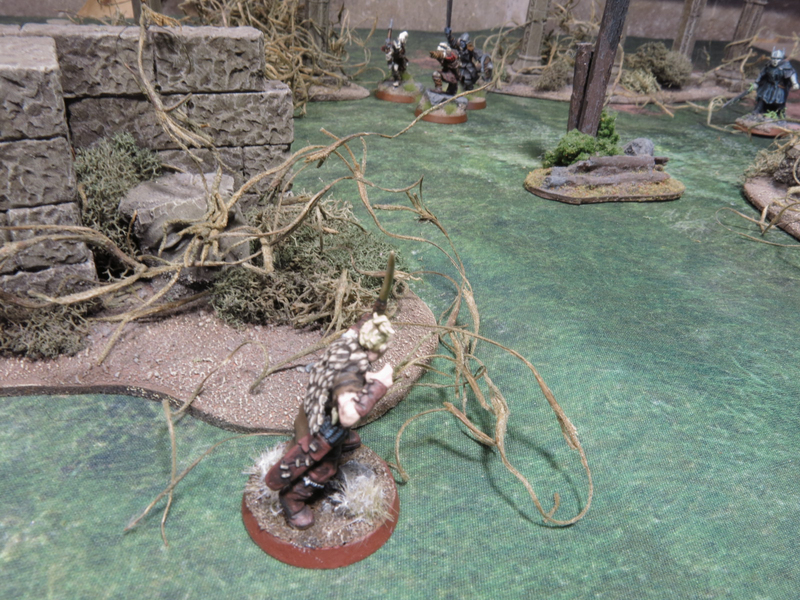 Gord in combat with Swamp Zombie 2 attacks (17,11) with Sigurds supports he wins 20-11 with -1 damage with his dagger the 7 damage is more than enough to put the Zombie down…2 down! Skuti makes his Swim check at TN5 (10) finally he is free and on the beach on his 1st action on his second action he turn a fires his bow at the Fly that show up behind at the bottom of the steps (16,6) Skuti hits! 18 to 7 the Fly is skewered for 12 damage and goes down hard..way to go! 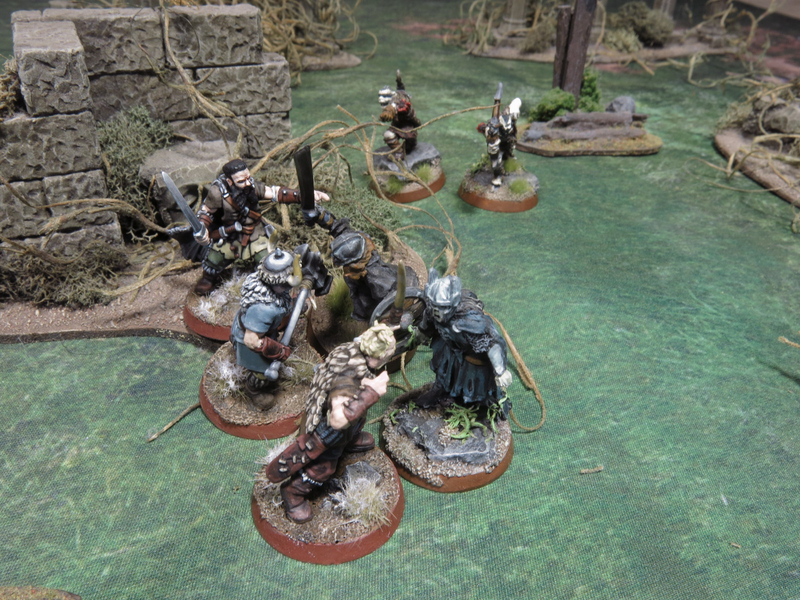 Swamp Zombie 1 in combat with Blackwulf and Guthrum attacks Guthrum as his health is lower, Blackwulf is Supporting (4,19) OooFFFF. Brutal hit on poor Guthrum from the Zombie he lose 19 to 9 and its 8 damage and Guthrum has 8 health he goes down and Out of Action. Swamp Zombie 4 is still clawing at Thorvald in the water he attacks (14,15) another tie due to Thorvalds fighting while swimming penalty 15 to 15.. the Zombie takes 3 damage while Thorvald takes 4 hes is down to 1 health. Sigurd wants to help Thorvald but I cant reach the combat with the distance penalty and have risk the swim check to attack. 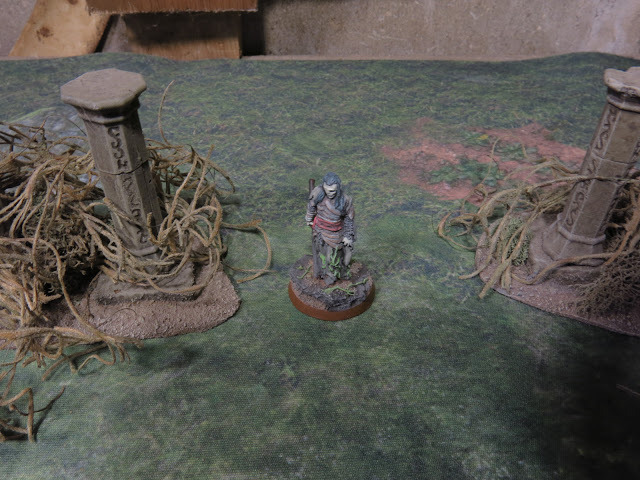 He moves into combat with Blackwulf and attacks Swamp Zombie 1 (9,9) Sigurd wins 14 to 9 but its only 2 damage this Zombie only started 6 health its down to 1, die already! 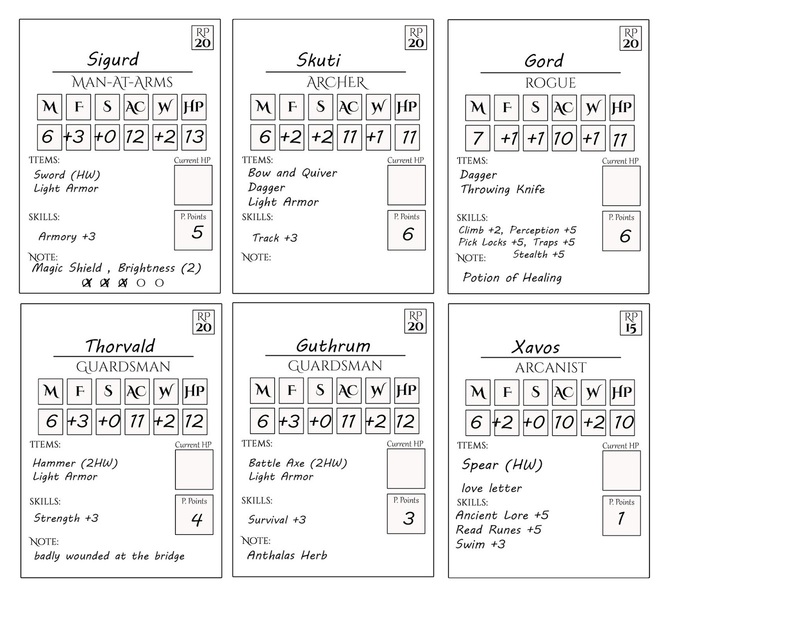 I roll randomly and its Gord our Rogue! 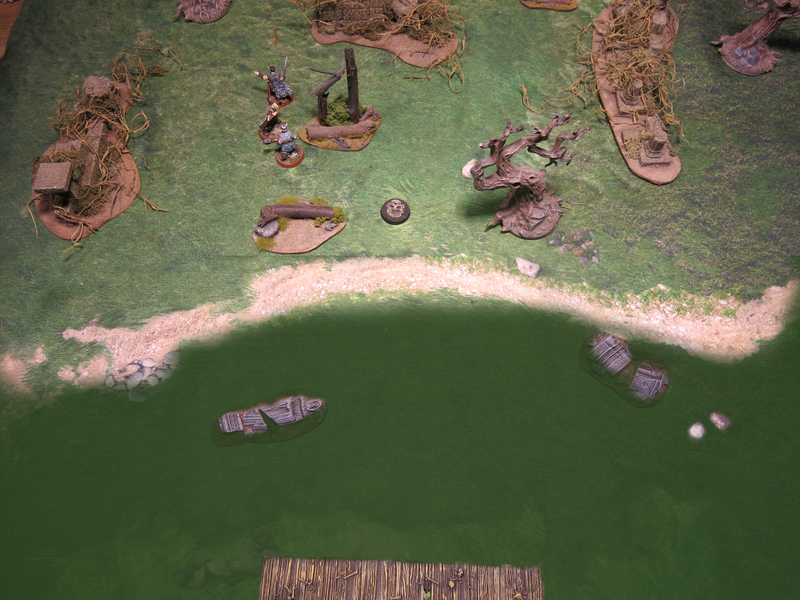 The environment here is worse then the creatures...the rogue in the sinkhole was an issue! 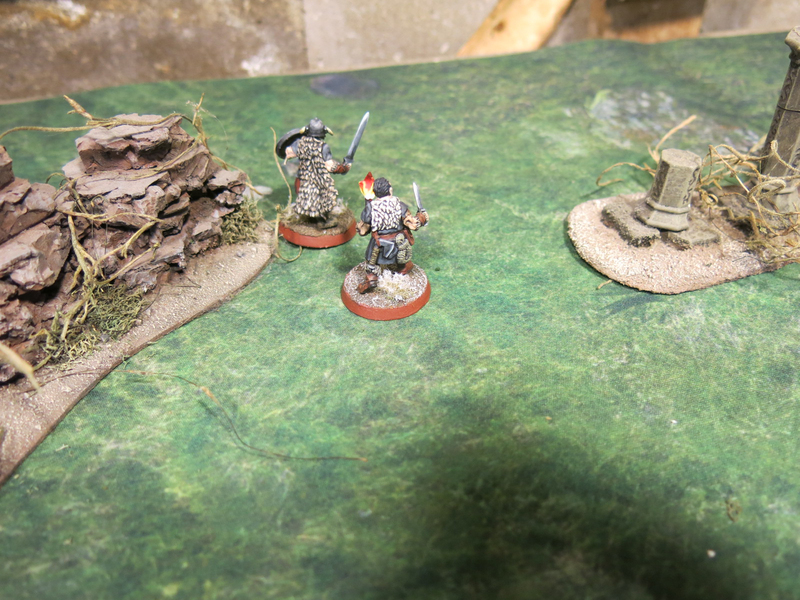 Sigurd takes a double move after Xavos in case trouble finds him wandering off alone. 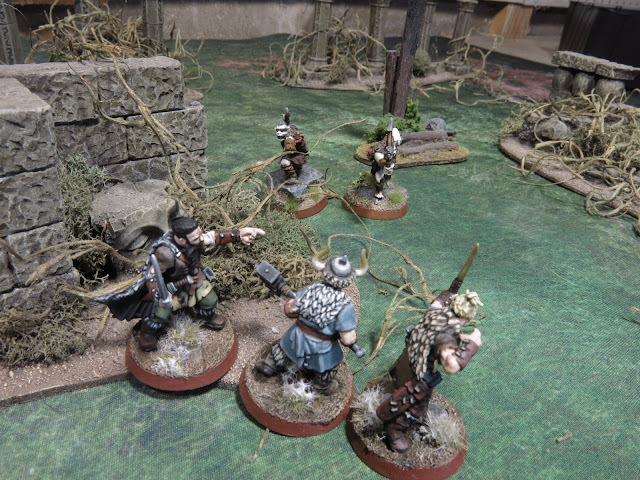 Swamp Zombie 4 has 3 health remaining its now in combat with Thorvald and Blackwulf , its attacking Thorvald who is on his last legs but Blackwulfs support will offset the Fight Penalty (20,4) that did for damage purpose its 25 to 4 because of Thorvald 2 handed weapon 13 damage mashes that Zombies head to paste it falls back beneath the stale water. 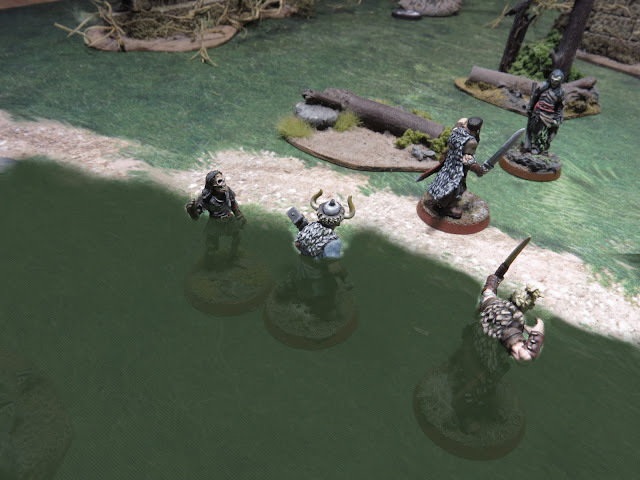 Thorvald must make a swim check TN5 (6) -2 = 4 fails…but not enough to do any damage he struggles in water gasping for breath. 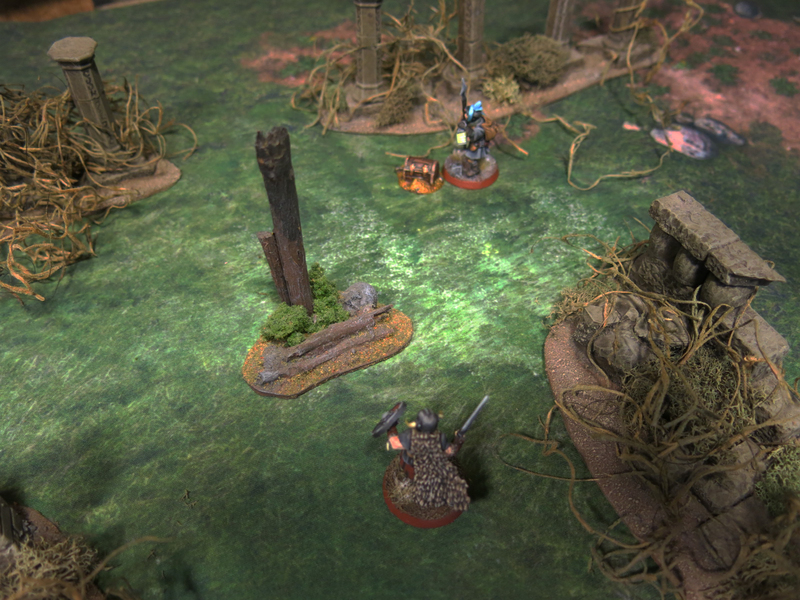 Xavos reaches clue marker 3 roll is (2) Treasure Token, that is some good news he picks it up with his second action . This shot is from Turn 8, its shows how long it took to get clear of the water and initial Zombies most of the game! His first action is to use his Heal spell on Thorvald bringing him to 6 health. He joins Blackwulf on solid ground. Gord's lucky knife strikes again...its happened so much its now a "thing"
No one is in deep water so we place a Swamp Zombie near where Xavos just left the board he got lucky he didn’t linger around! Gord. 3rd try to free himself from the Sinkhole TN 12 (+6) this time (9) +6 =15 hes free! No creatures on the board. so lets give it to him! Roll D3 I roll (2) the far board edge we are trying to exit No Escape yet! Orc Patrol shows up right as we are getting close to exiting the board..
Thorvald moves toward Blackwulf stopping behind the Ruin for cover. 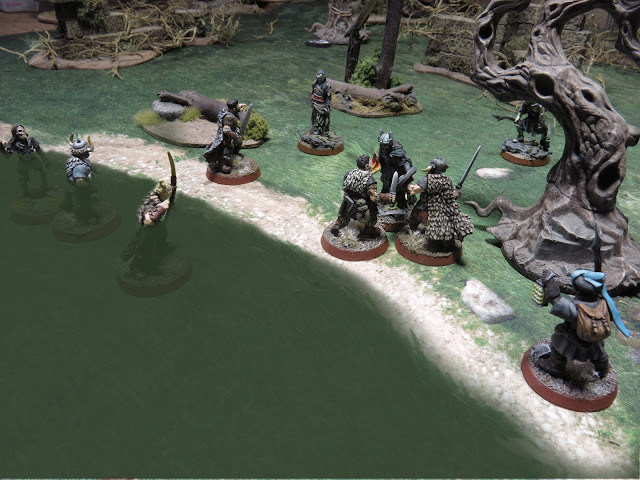 Skuti is bait as both the Orc Fighter and the Swamp Zombie see him as the nearest target and both advance on him , neither can reach but the Orc is close. Sigurd stays put in case he is needed. Oh no not again!, not good thing to happen going into turn 10 with 4 bad guys on the board. 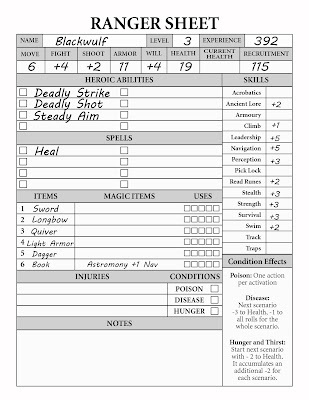 I roll D4 (2) its Ranger Blackwulf! Blackwulf makes the sinkhole escape TN 12 Strength check, he is +3 and Thorvald is right there for +2 so its +5 roll (15) no problem hes free. 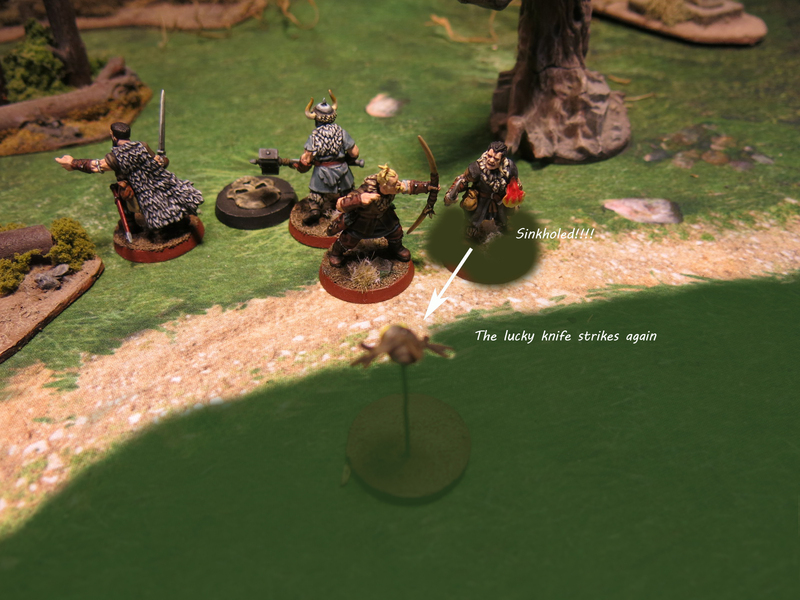 Orc Archer 1 and 2 can see the combat but cant shoot into it , so they move toward the combat. Last turn cant engage, no missile weapon…Sigurd Leaves the board so we get the XP. Frenzy. 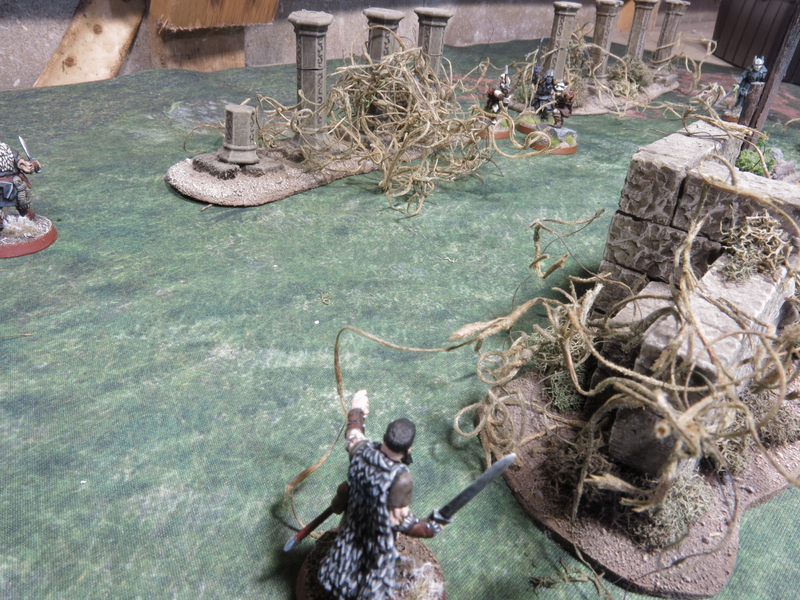 Something in the air causes all evil models on the table to go berserk. For the next turn, all evil figures receive +2 Fight. 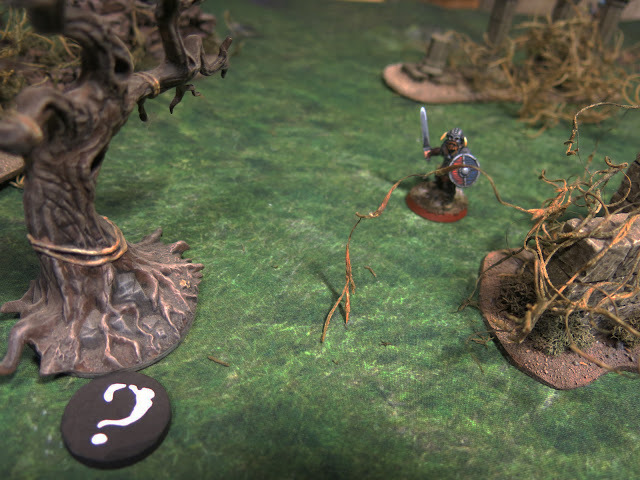 Swamp Zombie 6 attacks Skuti, Thorvald snaps into combat for support meaning the Zombie attacks Thorvald because of his low health (15, 12) or 20 to 12 , 22 with two handed weapon damage. Zombie is imploded. His Recovery roll. (20) HA..NO problems there…Full Recovery. Xavos found the Strange Flowers and a Treasure Token Roll (2) Gold and Jewels..
Well we will definitely take the Progression Point here for Guthrum so everyone gets one. Thorvald goes to 5 so he gets his +1 Health. 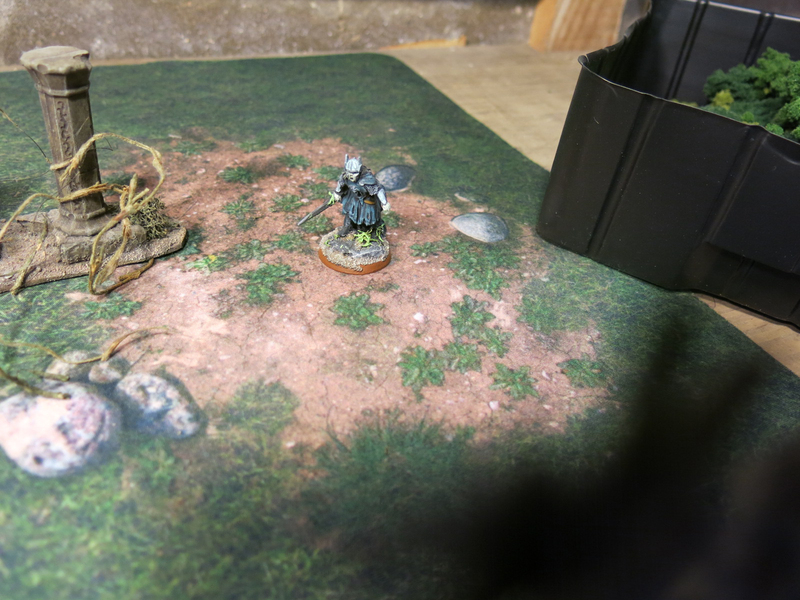 Sigurd gets the Bone Blade… hopefully that comes into use soon,. 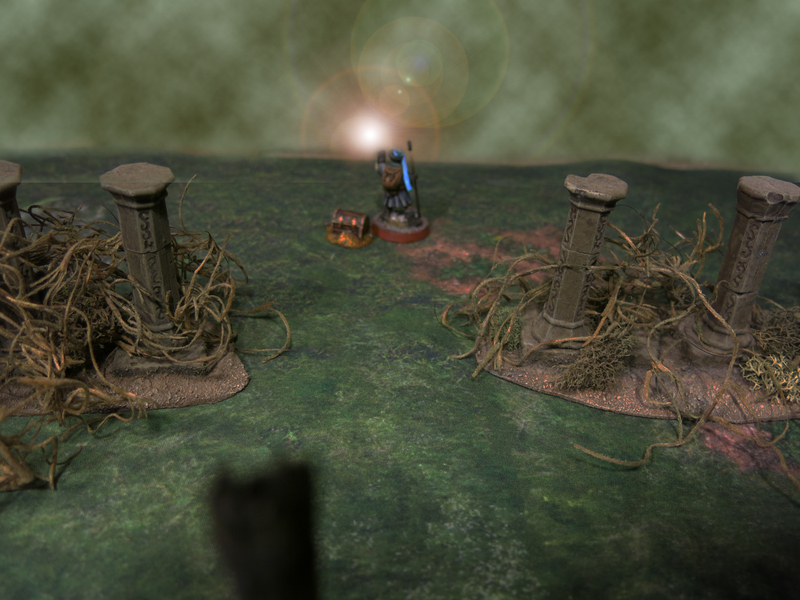 It’s a toss up between Hand of Fate, Powerful Blow or Frenzied Attack. Next up the Epic finale of the Rangers of Shadow Deep Introductory Scenarios THE LAST STAND. 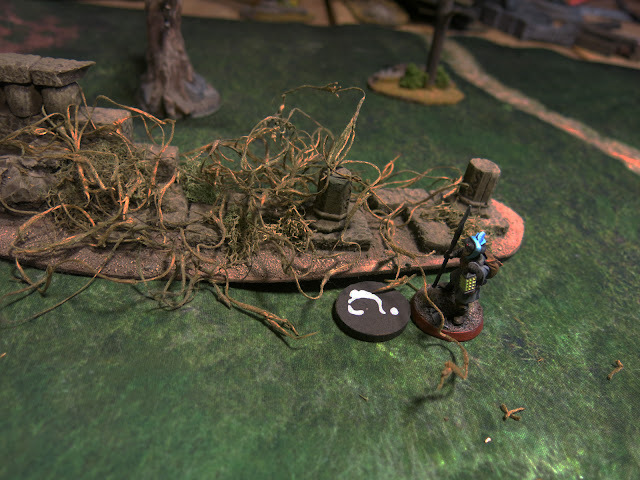 what product do you use for the stringy vine over grown vegetation??? its been along time but I think they are from the basket/flower arranging section at a Michaels Hobby store there some sort of filler for flower baskets but its sold in a bag, I found it hunting around for Jungle Materials years ago.. The fact that nobody has given you plaudits for that excellent green water effect in some of those pictures is a shame because it's very cool! Did you do that in Photoshop? Excellent job...I've not seen that before! Thanks Joe! and yes sir it is done in Adobe Photoshop! long time user here..I subscribe to it these days and use it enough in many different avenues of my life its worth the monthly fee!